In both the 73-74 and 2001 recessions, revenues fell sharply. Not as much as in the current recession, but the fall in both cases is still steep and pronounced. Yet, unlike in the present recession, expenditures stayed relatively constant during the recession. After the 73-74 and 2001 recessions, when the economy had recovered, expenditures did fall noticeably and the deficit flips from negative to positive, but this is exactly how countercyclical policy should work so that is not a problem, it’s a feature. But in the present recession, spending has fallen quite a bit which is not desirable. The failure to offset the fall in spending at the state and local level with help from the federal government is, I think, a large policy error. Even now, it’s not too late to help, but Congress has decided not to provide any additional help to state and local governments. When this is finally over, we need to figure out how to do better the next time a severe recession hits. But, unfortunately, it doesn’t seem likely that such a discussion will take place, or even if it does, that there will be any action in response. 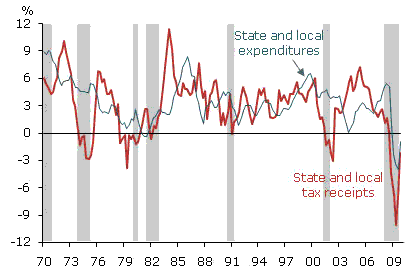 The real fiscal problem is spending contraction at the state level (expanding and contracting spending are not symmetric in their effects; contracting spend hurts more than expanding spending helps). The correct fiscal policy move would have been, and still is, to take Medicaid away from the states and make it fully federal. This would give state budgets a huge break, and help employment, yet as a one-time change it reduces the moral hazard problems from ongoing outright grants. The moral hazard issue is the difficult hurdle. You don’t want states to simply substitute federal for state spending, or intentionally make their budgets look worse in order to get more federal help. Many policies that can be set in advance to help state and local governments give them the incentive to do one or the other. However, mechanisms to offset the bad incentives exist, and that’s why it’s important to discuss how we can improve the next time this happens. We can design policies that minimize these problems, but that won’t happen if we don’t take the time and effort to design and implement effective strategies to overcome the unfortunate tendency of state and local governments to make recessions worse.